Giving life to all of nature’s creatures, water is an element worthy of reverence and protection. Artist Corrine Hunt chose the Orca and the Salmon to represent the element water in the Water Suite. These two marine animals are prominent figures in Aboriginal culture and mythology. Travelling across the oceans as a group – or pod – the Orca symbolizes community. This message applies to both Aboriginal culture and wider society as a whole. Community means supporting one another and living together harmoniously, as the Orca does with its pod. Hunt designed a series of orca fins along the entrance wall and a carved metal orca motif to convey this message. These artworks also serve to welcome guests into the Skwachàys Lodge community. Hunt then chose carved salmon motifs to represent our vital connection with the natural world. The Salmon and its inhabited waters are closely linked to the history of Aboriginal survival. The Salmon, therefore, symbolizes respect for the environment, as we need species such as the Salmon to survive and thrive in order to maintain our own prosperity. Together these animals communicate messages that have long been important in First Nations culture and which remain relevant today.Water is an element inseparable from the Northwest Coast. From the ocean waves lapping upon the shore to the ever-flowing rivers and streams, and of course the life-giving rains that constantly shower the region, every inch of British Colombia’s lush landscape has a relationship with water. This intrinsic connection inspired BBA Design to create the Water Suite. The suite is characterized by a distinct smoothness as if all the surfaces have been worn into shape by a constant flow of running water. Rounded edges and curved lines in the décor and furniture evoke the fluidity of moving streams and rivers. 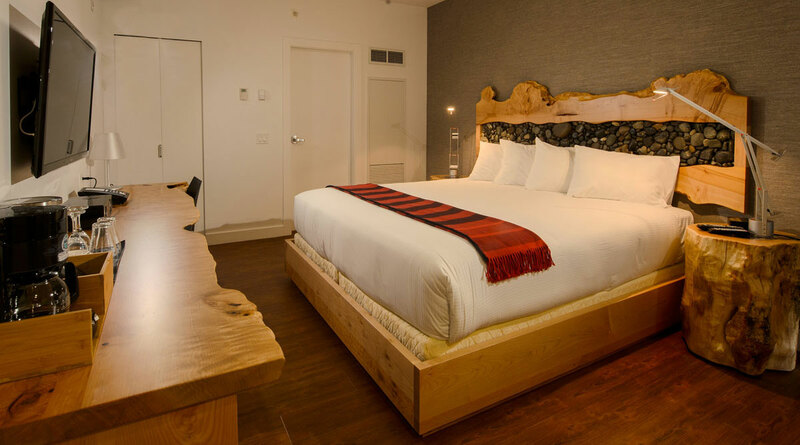 Wooden elements, such as the headboard, countertop and side tables, have been left in their natural state to ground the space and remind of the connection water has with our forested surroundings. 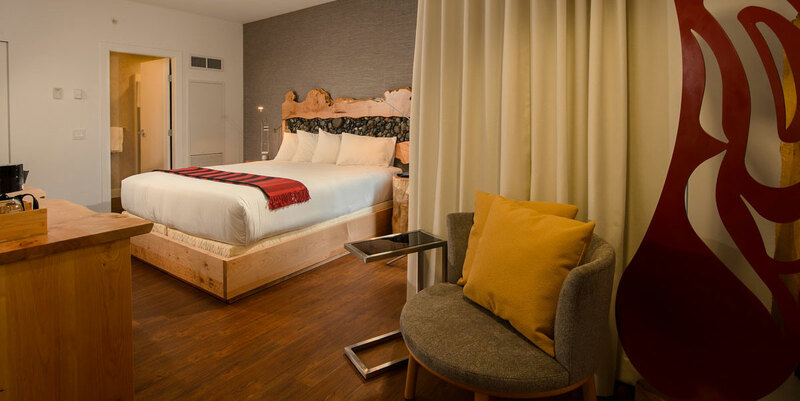 The headboard, one giant slab of wood with its edges left raw and gnarled, and lined down the center with a cluster of smooth river pebbles, most aptly illustrates this relationship. 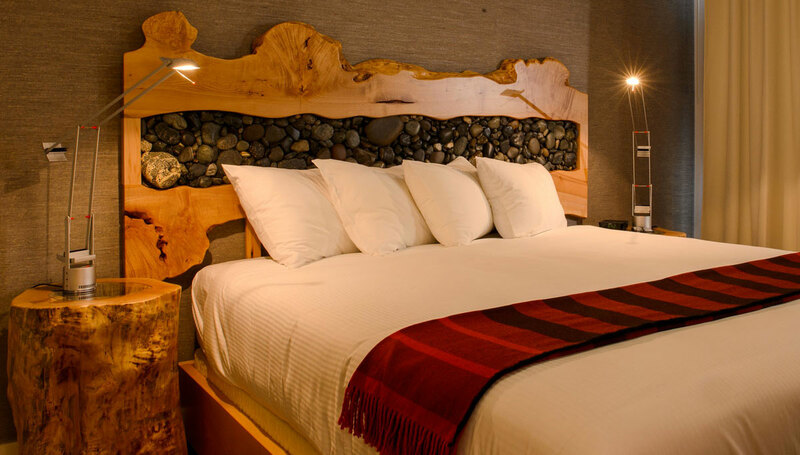 Artist Corrine Hunt’s minimalist metal carvings of salmon and orca motifs decorate the suite. They remind of the bond First Nations have long had with the waters of this land. Finished in a light palette of white and grey, the Water Suite is a tranquil space dedicated to celebrating this vital element.